In order to get started with Hugo, there are three main steps that you should follow. 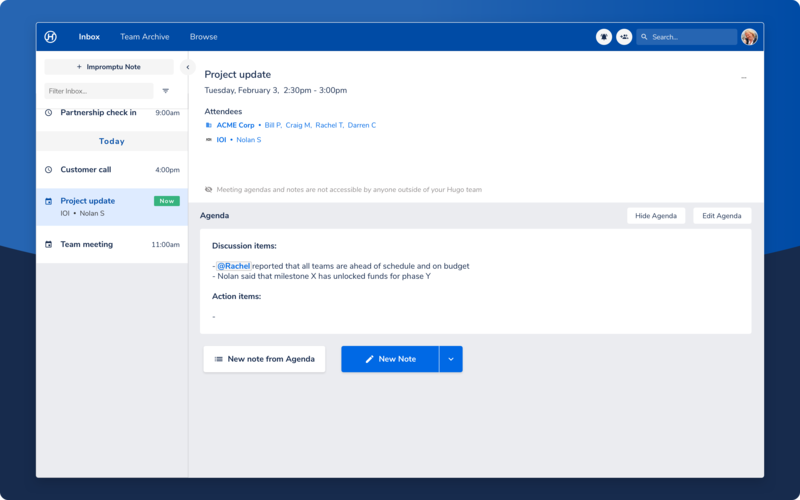 All your meetings are displayed on the left-hand side of your inbox, listed by date. Select the meeting as required. Alternatively, you can also select a meeting from the Team Notes. 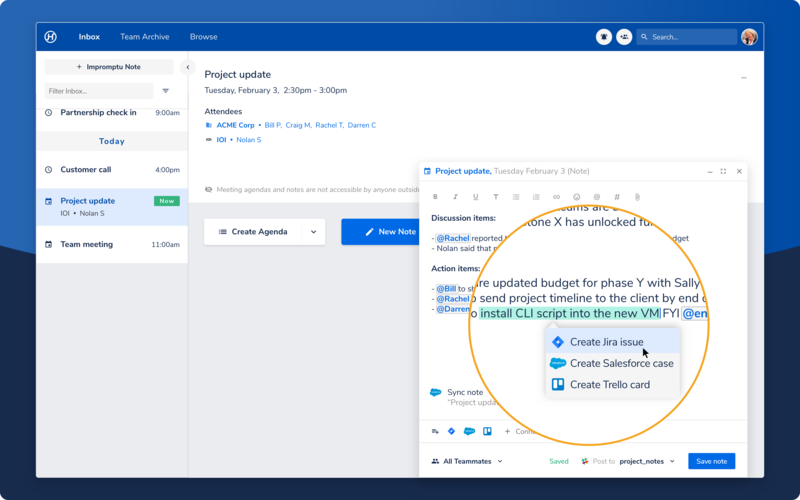 Click the + Impromptu Note to create a new meeting. Please note this will not create a meeting in your calendar. Meeting agendas can be set days or weeks before the meeting begins. Note that when an Agenda is finalized, Hugo notifies other teammates who are also attending. 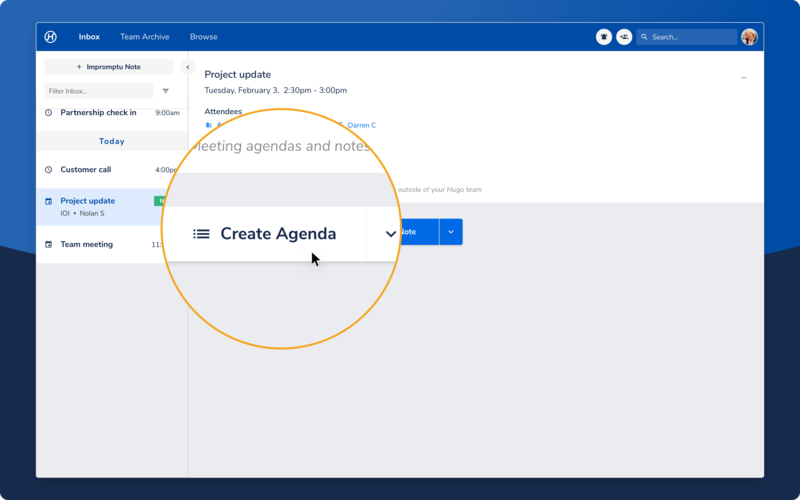 To set an Agenda, select a meeting and click Create Agenda. Click on the arrow drop-down if you wish to use a Template for creating your agenda. To learn more about customizing and using templates, refer to the Template section. In the Agenda editor, type your Agenda as required. @mention a teammate: Click the @ button in the toolbar or insert using your keyboard, to select from a list of teammates/groups. Those who are mentioned in an agenda will receive a notification from Hugo via email and/or Slack, containing the agenda for review. Tip: This functionality is very valuable for team meetings as it allows the team members to contribute to the Agenda collaboratively. Click Save Agenda: The Agenda is saved and the teammates who are attending the meeting get notified through an email. Those teammates can also add to the Agenda if required. Tip: Saving Agendas for team meetings is more valuable than saving agendas for yourself. Notes are the most important part of Hugo. 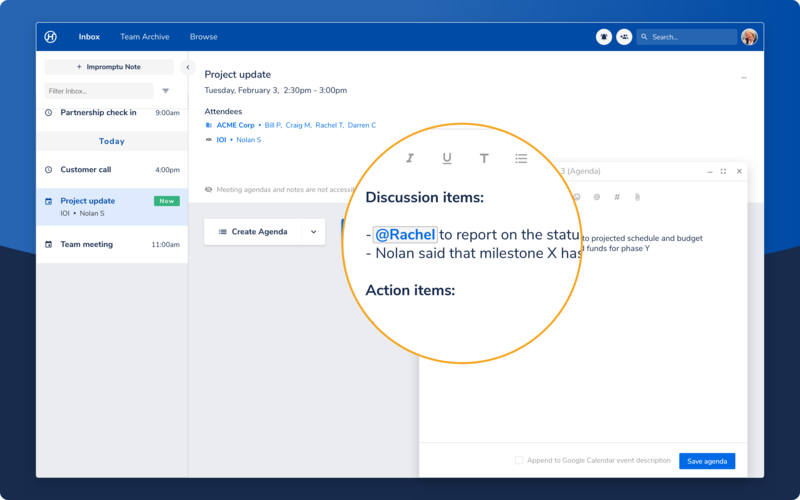 Hugo notes allow you to capture, share and action meeting insights to keep your team aligned. Insert @mentions: Use this functionality to mention a teammate or group in a note. Click the @ button in the toolbar or insert using your keyboard, to select from a list of teammates/groups. Those who are mentioned in a note will receive a notification from Hugo via email and/or Slack, containing the meeting notes. Insert a #tags: Add tags to organize notes more easily and make them searchable in the future. To use a tag in your note, click the # button on your toolbar on the top of the note editor or type # to select an existing tag. New tags can be created on-the-fly as well. Post to Slack: This functionality is very important as you can share meeting insights with people in your company and they don’t need to switch to Hugo to read the note. Posting notes to Slack is also a very fluid way of getting the right information to the right teammates without the friction of creating an account. Save Note: The note is saved and the meeting moves out of your Inbox to Team Notes. 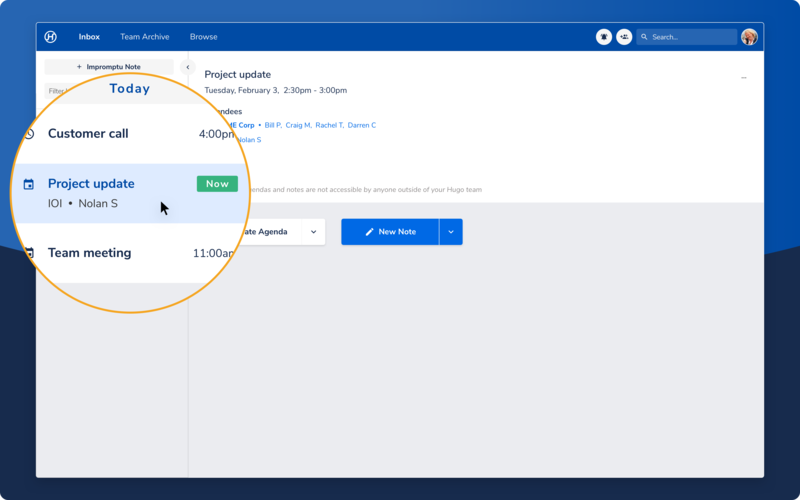 Syncing notes: Integrations with Confluence, Copper, Freshsales, Hubspot, Salesforce and Pipedrive allow you to sync your entire note to those tools when clicking Save. Visit the Hugo Integrations section for more information on how these apps work in Hugo. 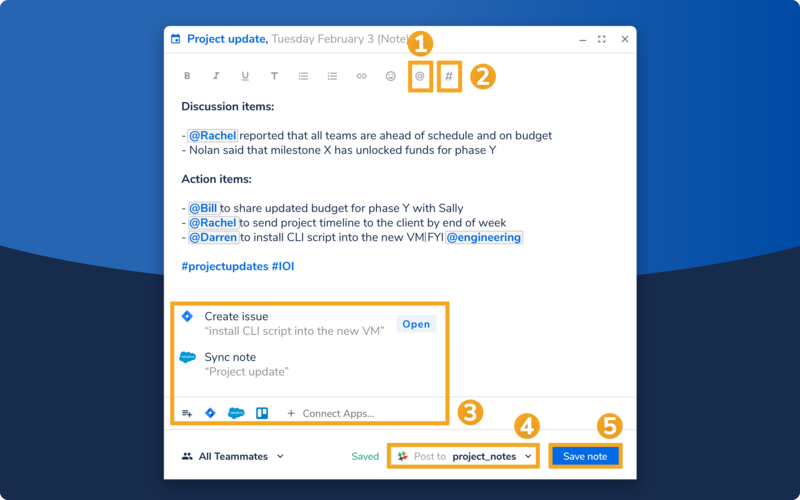 Note actions: Using these integrations, you can highlight a particular part of your note, and create an issue, task or ticket directly from your meeting notes. Note: The integrations displayed in your note editor are based on which have been enabled in your account. Visit Hugo > Settings > Apps to see a full list of integrations supported by Hugo. Hugo allows you to share notes inside the product, or by posting to Slack to send insights to teammates without them having to switch apps. Click on the drop-down to select the teammates who you want to give access to inside the product. 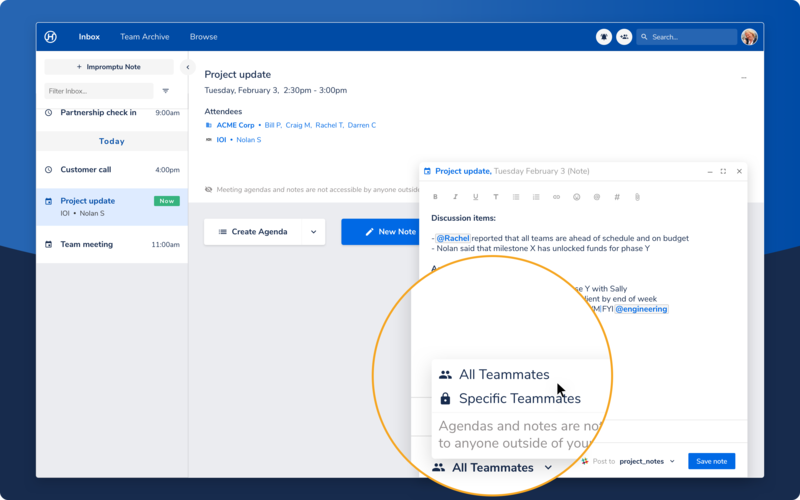 Teammates with access will see the meeting details, associated notes, agendas and comments in Hugo. Use @mentions to notify teammates who need to be looped in. Post of Slack to share the note in a specific channel or group message. Comments made in using Slack Threads will sync back to the Hugo note too.